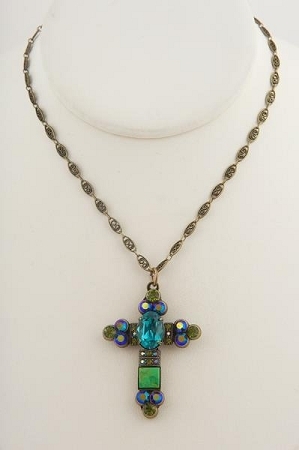 Impressive crystal cross is beautiful front and back, wear it either way. Set in antique gold American lead free pewter accented with Turquoise, Amethyst Aurora Borealis, Peridot Aurora Borealis, and Blue Zircon Swarovski crystals and semi-precious Mohave Green Turquoise cabochons. 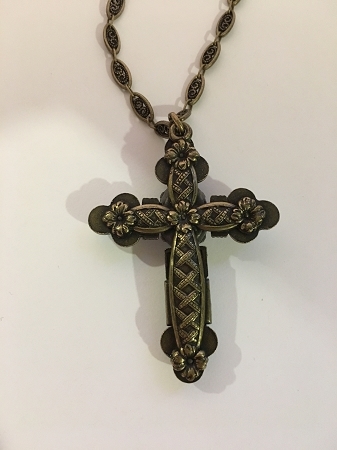 Large Cross measures 2" h x 1.25" w, chain is 18" long.